This afternoon one of my Camera Club friends, Steve, posted a photograph on flickr of a butterfly, suggesting someone might like to identify the breed for him. The butterfly was not of the usual common garden variety so I instinctively reached for my ancient copy of The Observer’s Book of Butterflies to see if I could decide which of the many hundreds Steve had photographed. On closing the volume, I happened to glance at the flyleaf inscription, which reminded me with some embarrassment still, of an episode in my very young life, of which I should feel no guilt as it was the adults in my life that were really to blame! I attended the Hope Baptist Church Sunday School and had done so for some years. My family was very involved in the life of this church; my grandfather was the organist and at the time of this tale (1960), the superintendent of the Sunday School, and my mother was pianist for the primary department. I attended Sunday School without fail every single week! 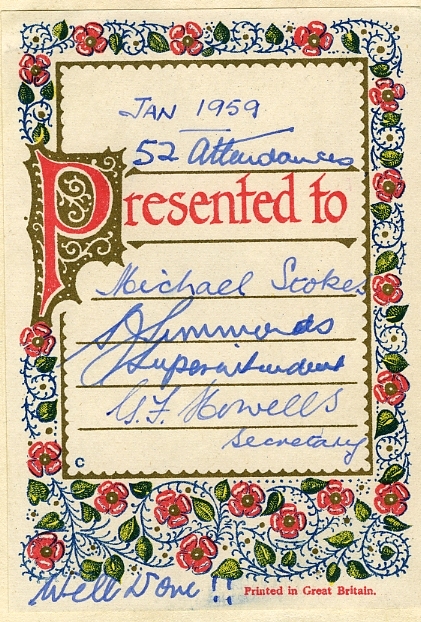 The annual prize giving was always held in January or early February and all the pupils in the Sunday School were given a prize of a book; the number of attendances dictated the value of the book, the more attendances, the better the quality. 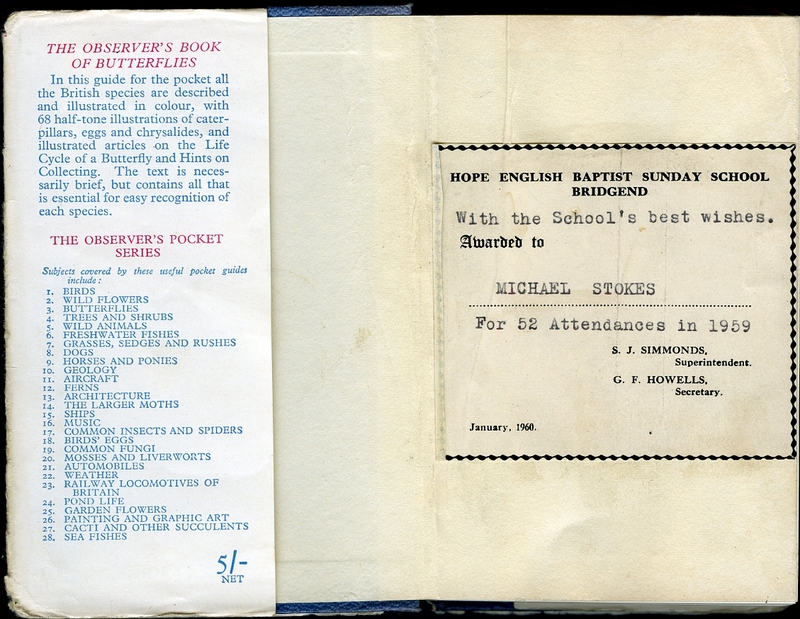 Those that attended 51 or 52 Sundays were given a book token, 2/6d for 51 attendances and 5 shillings for 52! This particular year though, there were two of us eligible for the maximum prize of five shillings and my friend Alan was called up first. On returning to his seat he excitedly whispered to me it was a token for 7/6d but before I could answer, my name was called and I bashfully walked up to accept my token, which to my surprise turned out to be for 10 shillings. I immediately thought some mistake had been made but was much too shy to say anything so returned to my seat and attempted to avoid Alan’s gaze as I didn’t know how to tell him mine was of more value than his! Naturally, upon discovering the discrepancy, Alan’s mother questioned this and it later transpired that at the meeting to decide upon the prizes for the students, my grandfather (Superintendent remember?) had reached into his pocket and pulled out a number of coins, stating that he’d like to increase his grandson Michael’s prize to ten shillings and was willing to donate an extra two shillings and sixpence to Alan, asking if other members present would donate cash to make up the same amount. There were no takers hence the reason for the difference in the prize amounts. Alan’s mother accepted the explanation and thanked my grandfather for his generosity; nevertheless, the memory stayed with me as an embarrassment throughout my Sunday School days and Alan and I never discussed the matter again! That year I was able to buy two Observer’s books for my collection; the book of butterflies and the book on larger moths. Unfortunately only one book plate was issued so I elected for it to be stuck in the book of butterflies. It wasn’t such an elegant plate as had been issued the previous year though (shown here), which was adhered inside my Observer’s Book of Railway Locomotives! Wonderful memories Mike, and all from a photograph of a Butterfly, thanks for sharing.